As the economic recession in the EU seems to be drawing to a close, there is inevitable interest in what the effects on employment in different sectors of activity and occupations have been, or are still likely to be once all the repercussions have materialized. Indeed, given the lags in both the collection of data and, more importantly, in the effect of a downturn in output on employment, it is likely to be only some time after the recession comes to an end and economic growth gets back close to its trend rate that the consequences for jobs will be apparent in the official statistics. 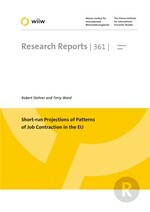 Although any estimates, or predictions, of this kind are fraught with difficulty and highly uncertain, it is instructive to look back at previous episodes of economic downturn to see what can be learned from them, in particular about their differential effect on different parts of the economy and on different groups of worker. This is the concern of the present study. Specifically, the aim is to examine previous downturns in the EU economies and the different consequences they had, first, for sectors of activity because of the varying nature of the goods and services produced and, second, for the different types of job within sectors. The further aim is then to use the results of this examination as the basis for constructing projections of developments in employment over the period 2008-2010 given the present forecast of the overall change in GDP. From this, the subsequent step is to consider the implications for employment in different types of job. As part of this, the concern is also to identify the kinds of job which stand to be most affected by the current downturn and the characteristics of the people at present employed in them in different parts of the EU.